At least 34 domestic and international flights were delayed, while three were cancelled. 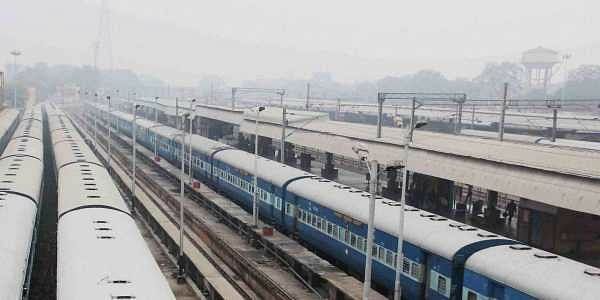 Around 14 trains were cancelled, 60 delayed and 18 rescheduled due to the thick fog in northern India. NEW DELHI: It was a cold morning with a shroud of dense fog covering the city on Thursday. Visibility stood at 50 metres disrupting train and flight operations. At least 34 domestic and international flights were delayed, while three were cancelled. Around 14 trains were cancelled, 60 delayed and 18 rescheduled due to the thick fog in several parts of the northern India. The minimum temperature was recorded at 5 degrees Celsius, two notches below the season's average, the Met said. The humidity at 8.30. a.m. was 100 per cent. The MeT predicted shallow fog towards the end of the day. "The sky will be clear," an India Meteorological Department (IMD) official said. The maximum temperature was likely to hover around 19 degrees Celsius. The maximum temperature on Wednesday settled at 18.4 degrees Celsius, one notch below the season's average while the minimum temperature was recorded at 7.4 degrees Celsius, normal for the season's average.